A very versatile baitfish fly. Not only are the color combos endless, but size up or down for your application. 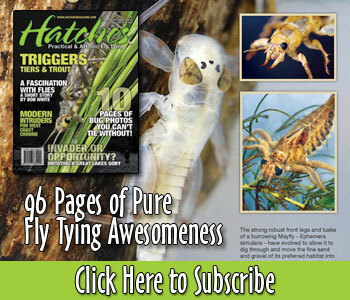 OPST’s newest fly tying video on how to Tie Jerry French’s Skinny Hoh fly. The Skinny Hoh is a slimmed-down version of Jerry French’s Dirty Hoh, a cross between an intruder and a string leech. It features composite loops, which Jerry uses to put multiple materials in a dubbing loop for a totally unique look and action. This video gives a great step by step instruction to the composite loop, as well as the twisted hitch, Jerry’s way of securing a hook to a rabbit strip so that it will never come loose or foul. Learn from OPST guide Trevor Covich how to tie a large intruder for big steelhead and king salmon. An inverted double hook pattern that has endless color and size variations.